Chellis Glendinning was born just after World War II and came of age during the decolonization, liberation, and feminist movements. The central themes of her writings and presentations include the interlace of the personal with the political and a critique of mass technological society as contrasted by sustainable, nature-based cultures. She has written several books, including the Pulitzer Prize-nominated When Technology Wounds (1990), the acclaimed My Name is Chellis and I’m in Recovery from Western Civilization (1994), Off the Map: An Expedition Deep into Empire and the Global Economy (1999, 2002), Chiva: A Village Takes on the Global Heroin Trade (2005), and a novel in Spanish, Las Relaciones de Objetos (2018). Her next book in English will be a generational memoir, The History Makers: Meetings with Remarkable Bohemians, Rebels, and Deep Heads (New Village Press, 2019). Glendinning has also published in various journals, magazines, and newspapers, including Guernica, Orion, CounterPunch, Salon, Alternet, Santa Fe New Mexican, ColdType, San Francisco Bay Guardian, and Race, Poverty and the Environment. In Bolivia she has written for Los Tiempos, Le Monde Diplomatique, and Nueva Crónica. A few weeks after being jailed during the protests at People’s Park in 1969, she graduated Phi Beta Kappa from the University of California/Berkeley in social sciences. She received her Ph.D in psychology from Columbia Pacific University and for thirty years has been a licensed psychotherapist specializing in trauma recovery. In 1997 she was awarded the Río Arriba County Zero Injustice Award for her “courageous stand in support of the customs, culture, and traditions of the Native American and Indo-Hispano people of northern New Mexico.” She received the New Mexico Humanities Council First Times Award for Short Story Writing in 1989, and both Off the Map and Chiva won the National Federation of Press Women Book Award, in 2000 and 2006 respectively. Utne Reader named her one of the world’s visionary thinkers in 2001. Her “Rinconcito en el Cielo” radio series, produced for KUNM-FM/Albuquerque NM, won the New Mexico Broadcasters’ Association Community Award for documentary feature in 2010. 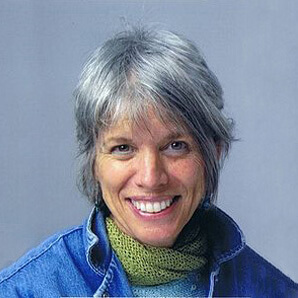 At the time of her Nineteenth Annual E. F. Schumacher lecture, Glendinning lived in Chimayó, New Mexico, where she worked with Chicano and Native people for environmental justice and cultural preservation. She now lives in an antique house in Chuquisaca, Bolivia. Her papers are housed at the Labadie Collection of the University of Michigan. Contact Chellis Glendinning about speaking terms and dates via her post box: Casilla 623, Sucre, Bolivia.